card from their hand to the field. to pay to use anything that will destroy chain energy. he can get deep in a hole in a hurry. put up a defense or play a monster to attack. the game up for chance. Scott Gerhardt If you're playing a fast deck that tries to get a jump on your opponent, then this may be the right card for you. Being able to play a lot of things plus this on turn 1 can put your opponent into an early hole. It would not be long before you won the game. On the whole, it's not that useful and should not be thrown haphazardly into any old deck. *Pay cost for playing / seting a card. *You have to pay too. their own card that they played. 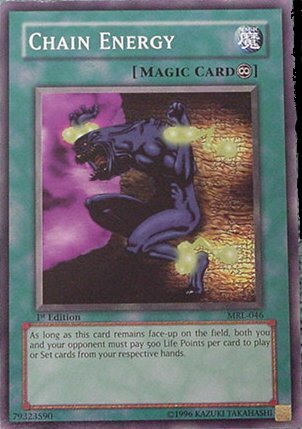 If you manage to obliterate your opponent's Life Points, then get this down, they won't be able to do a thing. Play 3 of them, and watch them die! The effect is cumulative, so if you get 3 of them down (put them all face-down first, to circumnavigate them affecting each other), they have to pay 1500 LP to play one single card! Just make sure you have enough Life Points to play a card if you need to, otherwise you may deck yourself before you deck them! You can break this thing with Card Destruction + The Bistro Butcher + Gravekeeper's Servant to run your opponent's deck into the discard pile, then make it so they can't use any cards to retaliate! Very, very evil. If you get a good lock set up with this, your opponent may as well resign. It makes for a very unpleasant late game surprise if your opponent is planning a comeback late game. It is highly situational, however. Ouch. Whenever you or your opponent play or set cards you must pay 500 life points? Geeze if you play this card right you can seriously screw your opponent over. But it does make you pay 500 as well so its kinda like a double edged sword. You gotta watch out for the usual heavy storm, mystical space typhoon, giant trunade and magic jammer though. So should you play this card? Well that depends on your deck. I think its too much to pay though but at the same time your opponent has to pay just to get rid of it. So its okay. But not really good. Having this card in play is a double edged sword because you'll be able to deal your opponent a lot of Life Points but you'll be hurting yourself too. I can see this card working in one of those silly stasis burn decks but they're just too weak in the current environment and too easy to deal with. This card would work a lot better in a beatdown deck; it'll allow you to deal those extras life points to finish your opponent before he can do anything to stop you. The card has a lot of potential but it can backfire on you so be careful.